AstroCryptoTriviology: Going Nuts in Orion to Mars? The successful Orion test flight in early December focused attention on the Orion capsule’s role in future NASA missions beyond low earth orbit. Much of the discussion on the Internet has dealt with the necessity of Orion at all, and whether it could be replaced by one of the commercial crew vehicles NASA recently funded. The on-line discussion is frequently sidetracked by the all-too-common misunderstanding that Orion will be the sole habitat for 4-6 astronauts on the 2-3 year Mars mission. I Googled “orion mars” and found a comment to a Gizmodo article wondering how 5 or 6 astronauts could spend months in such a tiny capsule heading for Mars—it was posted 2 days after the Orion test flight! The short answer is: nobody expects anything of the sort. Orion is the astronauts’ taxicab from the launch pad in Florida to the Mars transit vehicle in earth orbit at the start of the mission, then again and most importantly for the high-speed entry into earth’s atmosphere at the end of the mission (see figure 1). This is well-established in the NASA Mars Design Reference Mission that describes the general characteristics of the 100 thousand pound habitat (ref. 1). However, the misunderstanding was a central feature of the movie “Capricorn One” (1978) (ref. 2). This fictional story of a hoaxed Mars mission includes the image of the three astronauts spending long months inside their cramped Apollo command module en route to Mars. The movie used accurate mockups of the Apollo capsule, the lunar lander and the space suits, very familiar to TV viewers from the moon landings only a few years earlier, but largely irrelevant to the Mars mission being portrayed. The producers knew that such familiarity could enhance the credibility of their story, encouraging the audience’s willing suspension of disbelief. The bizarre tale of a faked mission and a government cover-up that required the (spoiler alert!) murder of the astronauts themselves would then have seemed even more thrilling. But surely (I thought), no one could seriously believe that NASA would send highly-trained astronauts in peak physical condition on a multi-month trip to Mars in just an Apollo capsule, with no room for exercise or privacy, any more than that they would land on Mars using an unmodified, non-aerodynamic Apollo lunar module. After all, the movie was an action adventure, not a documentary. Apparently I was wrong. Now, over three decades later, when I lecture on the medical aspects of NASA’s planned exploration-class missions to Mars, lay and professional audiences alike still ask how the astronauts could really stay in such a small capsule for such a long flight without going nuts. Of course, why should they know any better? The Apollo astronauts went to the moon inside the command module, so why not all the way to Mars? If the Mars trip takes 60 to 100 times longer, maybe it is just the price that the astronauts have to be willing to pay. After I explain that the Mars transit vehicle would be much larger and roomier, everyone seems relieved that NASA wouldn’t be so inconsiderate of its high-value crewmembers. What is more surprising is how many space professionals also have that misunderstanding. Even NASA insiders were confused in 2004 when the Crew Exploration Vehicle, or CEV, was announced, whether it was the Mars transit craft that would house the six astronauts for the half-year transits to and from Mars, or just the capsule they rode in from Earth to the transit vehicle. This confusion was exacerbated by the name: if it was just the taxicab, why was “exploration” part of its name? Back in October 2007, I lined up with NASA Johnson Space Center workers who waited patiently for a chance to sit inside the new, low-fidelity Orion mockup. It was in the configuration with six seats, one of which was occupied by mannequins and another left empty. When four of us—all space professionals but not engineers—were seated inside it, marveling at the close quarters, it quickly became clear that three of us actually thought this was the condition in which the six-person crew would make the six-month trip to Mars! After a lecture at a space life sciences conference in February 2008, a long-time NASA employee—also not an engineer—confessed his relief that the crew wouldn’t be cooped up in the Orion for the long trip to Mars. Other NASA science managers have wondered the same thing, judging from comments I have frequently heard. Not surprisingly, it is not just NASA people that are confused. A well-informed science writer asked me the question during an interview some years ago. About the same time, a retired astronaut sheepishly admitted that he thought the same, but added that he hadn’t kept up with the Mars vehicle design details. I have also read a comment by a respected leader of a space advocacy organization who wondered how Orion’s life support system would support a crew en route to Mars. Apparently the misunderstanding predates even Capricorn One. In 1966, Eric John Bishop felt it necessary to describe his work designing an underwater training mockup of what became the Skylab space station as supporting the development of a large vehicle for planetary missions, because the astronauts couldn’t be expected to stay in the Apollo for such a long durations (ref. 3). In 2006, NASA gave the name Orion to the CEV, and in 2011 the acronym CEV was replaced by MPCV for Multi-Purpose Crew Vehicle. Exploration was gone from the moniker but not from its mission; in fact, Orion was specifically focused on atmospheric entry at interplanetary speeds, and thus over-engineered and overpriced for anything less, as NASA managers have publicly confirmed. But the confusion remains. Why do so many people seriously think that NASA would confine half a dozen astronauts in such a small space for six months or longer? Why does that seem even remotely possible, let alone acceptable, to anyone who has imagined the effects of such confinement on the crew’s mental and physical health and on mission success? Part of the answer is probably unfamiliarity with the realities of long-duration spaceflight, at least among the general public. Another possibility became clear during the Orion flight test. Orion was described by the press as the vehicle that will take astronauts to the asteroids and Mars. Message boards were overflowing with confusion on that point. The official Orion fact sheet describes it as “this new spacecraft [that] will take us farther than we’ve gone before, including Mars” (ref. 4). And the Fall 2014 issue of Roundup (ref. 5), the self-described official publication of the Johnson Space Center, has a cover image of what is clearly a late-model design for Orion with what is clearly Mars in the background and with what is clearly no other vessel nearby (see figure 2). 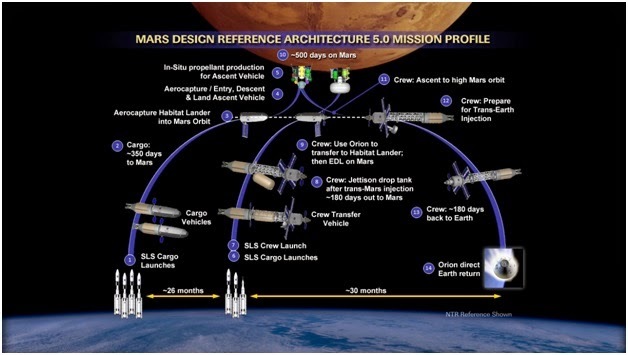 This constitutes an official graphic statement that Orion will at least operate near Mars alone, in direct contradiction to all NASA Mars DRM planning! Thus, NASA’s own messaging is misleading. Figure 2. NASA Johnson Space Center Roundup showing Orion spacecraft all alone in Mars orbit. That such a central feature of the NASA’s exploration architecture is so poorly grasped is troubling as well as surprising. NASA has released high-quality animations of lunar and Mars mission scenarios, which are available on agency websites and on YouTube. Program officials and industry experts have described the architecture in public presentations around the country. Still the misunderstanding persists. Space flight sometimes seems inherently mystifying. For example, the physics of weightlessness are a mystery to many people who have never experienced it, and are frequently misrepresented in movies. But most people working in space development venues do not require more than a passing knowledge of such things. They understand enough to do their jobs well, and they leave the rest to other specialists. Human exploration of space promises great benefits but only at great risk and great expense. Any meaningful public debate of the costs and benefits should be based on reality, not misunderstanding. Drake, Bret G. (editor), Human Exploration of Mars Design Reference Architecture 5.0 (NASA/SP-2009-566), NASA, Washington, D.C., 2009, http://www.nasa.gov/pdf/373665main_NASA-SP-2009-566.pdf (accessed Dec. 23, 2014). See “bat chart” on page 5, and Mars Transit Vehicle description on p. 36. Capricorn One (http://www.imdb.com/title/tt0077294/, accessed Dec. 8, 2014). Bishop, E.J. Brooklyn, Buck Rogers and Me. iUniverse, Inc., 2003, http://bookstore.iuniverse.com/Products/SKU-000125340/Brooklyn-Buck-Rogers-and-Me.aspx (accessed Dec. 23, 2014). Orion spacecraft overview, NASA, 2012. (http://www.nasa.gov/sites/default/files/617409main_orion_overview_fs_33012.pdf, accessed Dec. 8, 2014). 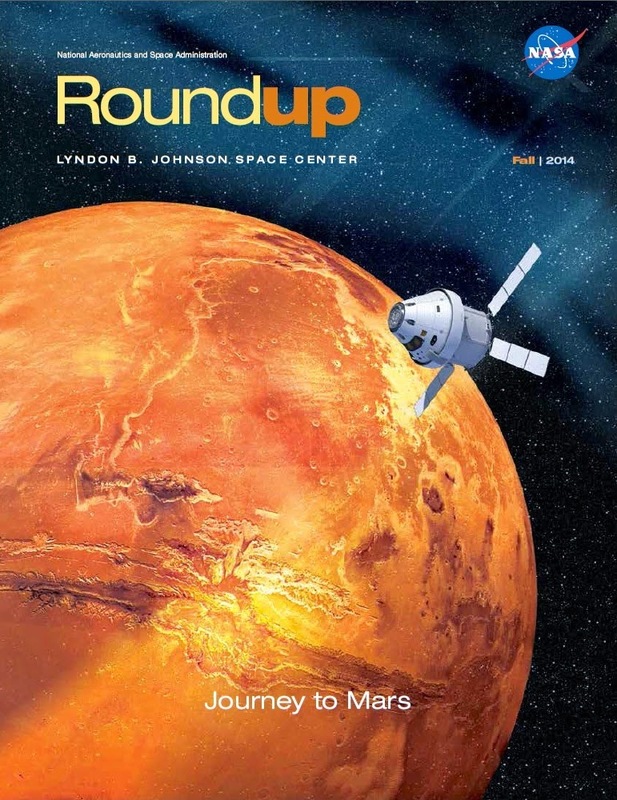 Roundup, Fall 2014, http://jscfeatures.jsc.nasa.gov/media/22_Fall_2014.pdf (accessed Dec. 23, 2014). It might be a long shot, but perhaps some people think of Zubrin's Mars Direct. The Earth-Return Vehicle wasn't a whole lot bigger than Orion. Each crew member had about the volume of a phone booth for the six-month trip back to Earth. This was made necessary by desire to generate all propellants for return to Earth on Mars and to land the ERV with the fuel factory.